Dreamtime boerboels downunder Australia, our friends and breeding partners. 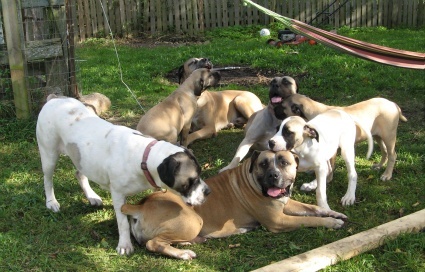 We breed the old type Ysterberg boerboels here at Abelles Kennel. Not only Ysterberg by bloodlines but also ,and most importantly we breed with old "ysterberg- principals" as main criteria for our work ! 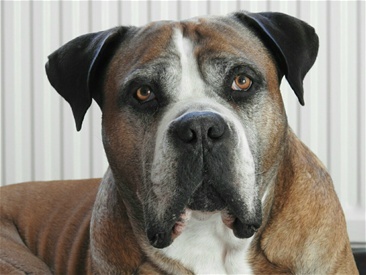 The Ysterberg bloodline was started by mr. Klaas van Waveren more than 40 years ago, it stands today ,as the oldest still living bloodline in the Boerboels history. 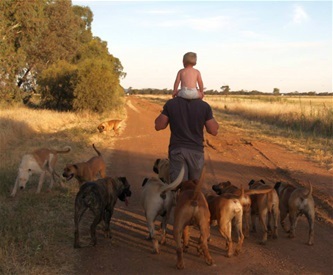 Van Waveren lived at a farm in south Africa and breed his farm dogs before they where recognized as the Boerboel breed ,he continued breeding under both "sabt" and "hbsa" (south african boerboel breeder association and historic boerboel south africa) after they where formed. His breeding principals has made the ysterberg boerboels stand out as the most social and loyal bloodline in the boerboel breed . We consider these dogs to be the very essence of the boerboel breed ,and do our best to bring the bloodline further in to the future by trying to do the same as old Klaas. The principals that make ysterberg boerboels special are the same principals who can ensure the future of the very boerboel breed. A breeds ability to reproduce it self, to give birth naturally without veterinarian assist-ens ,to take care of its of come without hearting it and to be able to live in a natural dog pack as the natural animal it is... these are cornerstones of great importance ! Modern dog breeding does not value these cornerstones , breeding boerboels in our days does more and more focus on making the breed extreme ,more muscles ,bigger heads ,broader chests and it looks closer to a mastiff bulldog than a sound working farm dog from south Africa! Every dog breed true history has had its popularity period, all without exception have suffered big from that time . When i think back to the mid `90 s ,you could see up to 10 ads for dogge de bordeaux in the local paper, today the breed is gone more or less down the drain ,to find a sound bordeaux is almost impossible. The average age of such a dog is down at 5 years and the chance to get one without major health problems is 1 to 5, that is sad for such a great breed ! We here at Abelle Boerboel want to keep a part of the boerboel breed in a condition where it can survive the impact of the breeds popularity ,we have choose to honor the oldest represent genetics who are still at live for that, the ysterberg dogs.